This class from instructor, Kim St. Jean, is a student favorite. 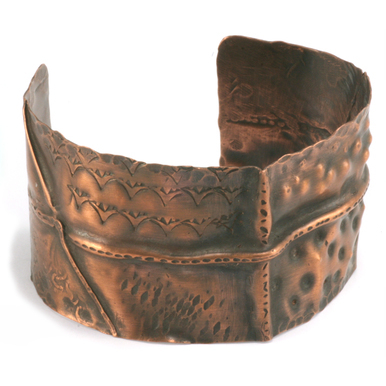 Kim makes shaping heavy-gauge metal a breeze and shows how to size, texture and rivet a bodacious bangle bracelet. This class is suitable for the metalworker who has some experience, but seasoned pros will also enjoy the great tips and tricks that Kim shares in this class. This class has a run time of 70 minutes. Center Punch - $3.00 - Kim uses this as her flaring tool. I love anything Kim makes :) I own all her books too! She makes every project with simple steps and always includes some really easy tips to help you make a finished piece that you love! She is my #1 favorite designer and I just know you will too! Thank you Jean for all the guidance and inspiration :) You Rock!! You simply buy an old metal iron and cut off the handles! You'll need a strong bandsaw or some other large blade that can cut the steel handle off. Try to look for an iron whose metal plate is not heavily marred. I LOVE the look of this bangle. I enjoyed the wrapping technique towards the end AND the use of the tacks. Very clever!!! I look forward to trying this with brass perhaps, and finishing with the LOS and incorporating some turquoise for a Southwestern feel. This bangle is definitely on my list of items to make. Thanks for carefully explaining the steps. I love the idea of the cut tacks. They're a lot less expensive as well! Great video, enjoyed the format and execution. Very informative with lots of interesting techniques and tips that made making my first bracelet as easy as watching the video. PLUS the end product is brilliant! LOVED the video and loving the bangle even more. Kim, you truly are an excellent instructor! I'm excited to try different design elements to make each bangle unique! I've looked in all our local hardware/DIY stores and can't find #2 cut tacks anywhere. Any suggestions? I really would like to try riveting with the tacks! Try searching online for #2 cut tacks. You may also find them called #2 carpet tacks or #2 upholstery tacks. Or, you can use another nail head rivet, remember to make sure the hole and rivet size are a tight fit. Thank you for the advice on making my own bench blocks! I found 2 old irons on etsy and they turned out perfect! Kim St. Jean is who I aspire to be..........someday! No matter how many times I've watched this class, I always take away something new. I really enjoy Kim's easy manner, and the way she teaches the class. I loved this video!!! Kim is a excellent teacher and I learned a lot. I love the tacks as rivets!!!! This might be my favorite class. Kim is such a good instructor, she made me feel like we were having a conversation. I've made riveted bangles before but decided to take this class because of the glowing reviews and I'm certainly glad I did. Kim has so many pointers and ways of doing things that I came away with lots of new knowledge. Thank you Kim and Beaducation. It took me awhile to get around to doing this class, even though I had watched the video a few times and had all the supplies. In my first attempt I didn't hammer the paddles thin enough to get a second hole using my screw down of pliers style hole punch. The power punch got the job done! While working on the first one I thought I would only do one more, but completed a second one with the intention of moving onto something new. I had so much fun I ended up making a few more bangles and ordering more supplies! I like that the video is broken into segments so when I need to go back for a refresher I can easily get to the section I want to view. Kim does a great job with step by step instructions. 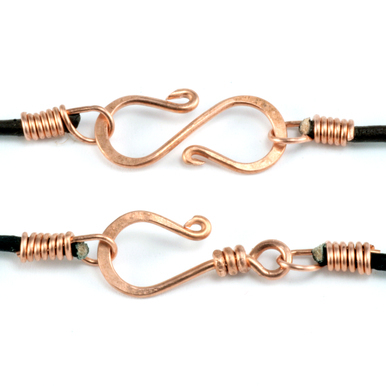 I am new to working with copper and so far I love it! I learned sooo much from just this one tutorial. Thank you!! I've watched this class twice now, and love it! I've made a couple of these bracelets now, and Kim's instructions are SO easy to follow - that even I can do it! And I love how she does her wraps! It looks so nice and finished! Thank you so much!